Level 2 First Aid, which is officially known as Provide First Aid HLTAID003 (and was previously known as Senior First Aid) has been an industry standard attainment for decades. 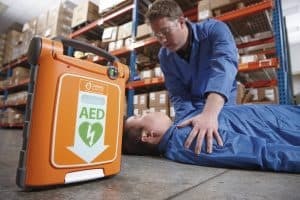 The course offers a comprehensive overview of all major first aid and CPR procedures, while also familiarising course participants with state-of-the-art first aid equipment. Real Response courses include simulation training for immersive learning, greater information retention, and the confidence to respond with precision if an emergency arises. Level 2 First Aid certification lasts for three years and can be easily updated with one day’s attendance at the HLTAID003 recertification course. Accessing an emergency and assisting casualties can be performed safely and effectively by following Level 2 guidelines. With the right training, anyone can become proficient in delivering first aid assistance, and Real Response was established to broadcast first aid, CPR and resuscitation procedures as life-skills worth knowing. Real Response courses are progressive, offering adaptable attainments and a skill-set that can be expanded for industry-specific purposes. Level 2 guidelines provide life-saving techniques that can be systematically applied for the best possible patient outcomes. With diverse life-saving applications and procedures available, first aid response using Level 2 guidelines can be targeted for exacting patient or casualty needs. There are procedural steps to be followed in every circumstance, although equipment, devices and techniques will vary according to the individual ailment or injury, plus accident location. Level 2 First Aid (HLTAID003) is a nationally accredited course requiring only one or two days participation, yet it results in the confidence to face emergencies backed by a fully equipped first aid and CPR skill-set. In one sense, it’s difficult to achieve a rapid transformation from neophyte to competent first aider. At least that was the case prior to the introducing of simulation training, the Real Response innovation that has other training organisations taking notice. Simulations are used by the military, police, medical and emergency services to enhance knowledge and skills in a learning by doing environment, and first aiders are a natural component of the emergency response arsenal. The result is an effective first aid force working in the emergency ‘coal-face’, or in regular occupations where first aid qualifications are an adjunct to other work responsibilities. Emergencies don’t often happen, but when they do, immediate first aid response is often vital for lives to be saved. What Practical and Theory Does the Level 2 First Aid Course Cover? At Real Response, Level 2 First Aid (HLTAID003) theory and knowledge become practical attainments. Real Response course facilitators bridge the gap between theory and practice using realistic emergency scenarios that can be tailored to suit industry or workplace needs. In this way, course participants are immersed in the ‘experience’ of learning theory. The simulated learning methods are revolutionary, and a natural response by Real Response founders who noticed a glaring disparity between the qualifications and capability of accredited first aiders. Level 2 First Aid theory: Although simulated learning is a prominent Real Response feature, students require resources and guidelines for reference. Theory is particularly important in Level 2 First Aid, as it is an industry-standard introductory course that covers a lot of territory. Course participants develop a valuable understanding of first aid response and procedures under the guidance of experienced emergency services and medical personnel, along with guidelines that support every procedural step. For example, upon responding to an unconscious person, symptoms can disclose breathing problems, cardiac arrest or allergic reaction, with the appropriate choice of procedure imperative for recovery. Level 2 First Aid theory guidelines are tailored for ailment-specific emergency response, and backed up by a competent and informed approach regarding life-saving capabilities. Level 2 First Aid practice: It’s well known that theory only really comes to life when it is put into practice. Fortunately, the detrimental practice of placing newly accredited first aiders in the field without any experience is avoided at Real Response. Course participants get first hand experience in responding to an unconscious person, providing CPR, using a defibrillator, providing artificial respiration, administering anaphylactic shock treatments, airway management and many more procedures and treatments. Real Response simulations can be tailor-made, with reality enhanced using actors, emergency signals, sirens, time-specific challenges and a host of other Real Response innovations. The ability to save a life is an honour and privilege that Real Response takes seriously. The satisfaction of increased first aid competency should be motivation enough attain first aid credentials, and when the skills are applied in saving lives, the reasons for learning Level 2 First Aid become abundantly clear.